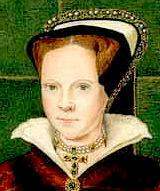 Queen Mary I of England (February 18, 1516- November 17, 1558 - reigned July 19, 1553 - November 17, 1558) was the daughter of Henry VIII and Catherine of Aragon, the only one of their children to survive infancy. She was alienated from her father, however, during his divorce (it was not a divorce in the modern sense, but an annulment) from her mother. As her parents' marriage was deemed null and void, Mary was then deemed illegitimate and thus deprived for a time of her status as an heir to the throne. By the time of Henry's death, however, she had been restored as second in line to the throne, after her half-brother Edward, who was physically weak. It was not until 1553 that Edward died, however, by which time Protestantism had gained such ground that a rival claimant to the throne was put forward, Mary's cousin Lady Jane Grey. Public sympathy remained with Mary, and she soon overcame resistance to her accession. By July 19 Jane Grey had been deposed and Mary was the undisputed Queen. Her official coronation came on November 30, 1553 .It is generally believed that Mary would have spared Jane's life if it had not been for the intervention of the Spanish diplomats who conditioned Mary's marriage to their king on her executing Jane. Mary had always rejected the break with Rome that her father had instituted and the establishment of the Anglican Church that had flowed from her half-brother's protestantism, and now she tried to turn England back to Roman Catholicism. This effort was carried out by force, and a number of Protestant leaders were executed. The first was John Rogers, followed notably by the former Archbishop of Canterbury, Thomas Cranmer. This earned the queen the title of Bloody Mary. Modern scholars have pointed out that fewer Protestants died under Mary than Catholics under Mary's half-sister and successor Elizabeth but admit that, averaged over the lengths of their reigns, the Marian death toll was indeed higher. Her restoration of Catholicism was remarkably successful in some ways: Where only one bishop -- John Fisher of Rochester -- had resisted Henry's changes to the point that Henry had him executed, most of Mary's bishops refused to conform to the restored Protestantism under Elizabeth I and died under house arrest. Mary also set in motion currency reform to counteract the dramatic devaluation of the currency that characterized the last few years of Henry VIII's reign and the reign of Edward VI. Mary's deep religious convictions also inspired her to institute social reforms, although these were largely unsuccessful. Her marriage to Philip II of Spain, in 1554, was unpopular even with her Catholic subjects; Philip spent little time with her once it became apparent she was beyond the possibility of conceiving a child. She was succeeded by her half-sister Elizabeth I, who quickly undid many of Mary's changes. Mary I of England is sometimes confused with her cousin Mary, Queen of Scots, who lived at the same time. Many scholars trace the nursery rhyme "Mary, Mary, quite contrary" to her unpopular attempts to bring Roman Catholicism back to England, identfying the "cockle shells", for example, with the symbol of pilgrimage to the shrine of St. James in Spain and the "pretty maids all in a row" with nuns.